Roasted potato wedges are so versatile and easy to make. 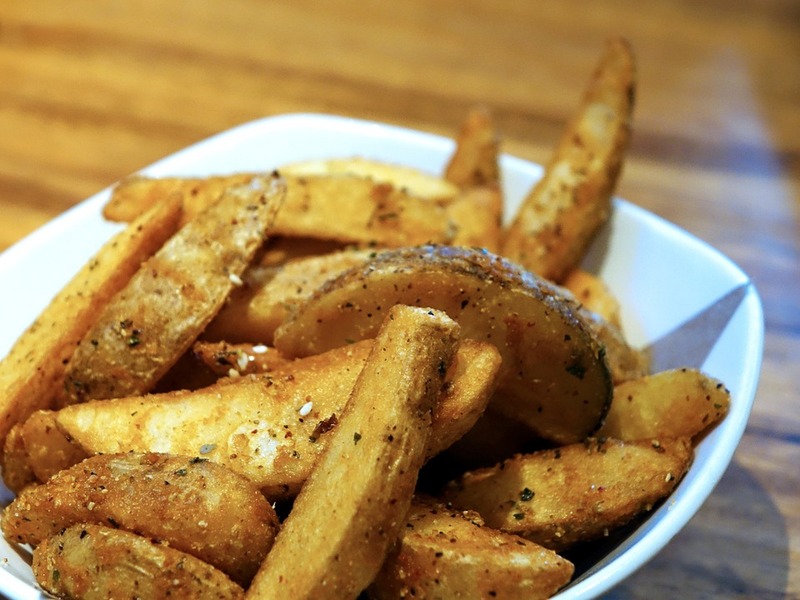 Try crispy wedges topped with salt, pepper, cayenne and paprika for a spiced up twist on traditional wedges. For crispier wedges, bake them for a few extra minutes and eat them up when they are still warm! For bite-size delicious finger snacks, these potato bites are perfect. Cut baby potatoes in half and scoop out the insides of the halves. Add cheese, minced beef and butter to the potato insides, salting the mixture to taste. Place the filling back in the halves and sit them on a baking sheet, baking for 10 minutes. Serve these bites of flavour with a dollop of sour cream for a tasty treat. For a healthy and crispy snack alternative, try making these crispy sweet potato chips. Slice sweet potatoes into paper-thin rounds with a mandolin slicer. Coat each piece in olive oil, and lay single layers of sweet potato rounds out on the baking sheets. Sprinkle with salt, and bake until crisp. Let the chips cool off for 5 minutes and then store in a plastic bag – if they aren’t already finished! Potato salad is a hit at any braai or dinner gathering! Peel the skins of boiled potatoes and cut into large diced pieces. First mix with chopped onion and sliced hard boiled eggs and then combine with a mixture of mayonnaise, yellow mustard and salt and pepper. Sprinkle with paprika. Remember to let both the salad and yourself chill for at least an hour before serving! Who doesn’t love crispy potatoes? We sure do. Mix dried off grated potatoes with onions, flour and any seasoning of your choice! Fry tablespoon fulls of the mixture in a frying pan, without overcrowding the pan. Press down on them slightly, letting each side cook for about 2 minutes. Serve with a juicy egg and some fresh herb sauce for dipping! For a crunchy treat, try these loaded potato skins! After boiling, cut potatoes in halves before scooping out the potato insides, leaving a ½ cm thick skin. Brush the skin with olive oil and use salt and pepper to season, cooking until crisp. When ready, fill the potato skins with cooked bacon and grated cheese and bake until melted. Serve with sour cream and sprinkled spring onions! For a potato dish that gets your blood flowing, whip up delicious mash potatoes with a wasabi twist. It’s simple! Mash up boiled potatoes with heated milk and butter until smooth and creamy. Add salt, pepper and a dash of wasabi to taste for that unexpected kick! Need an easy low-carb snack? These sweet potato toast slices are the perfect health-conscious nibbles. Slice a large sweet potato into vertical slices, about 1cm wide . Turn your toaster all the way up and toast each slice twice or until slightly browned. Top off with peanut butter, banana and cinnamon or try a fried egg to top it off.